The criminalization of the marijuana plant has had disparate impacts on communities of color in the United States for decades, but despite it still being considered an illegal substance at the federal level, states across the country have been increasingly passing measures to regulate the industry. Because California is projected to be the largest and most profitable market in the country, it is important to consider the equity implications of this industry. 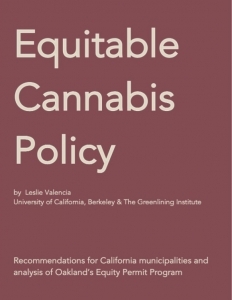 In this report, the city of Oakland’s Equity Permit Program is analyzed as a potential model of local equitable cannabis policy for other cities in California.